When it comes to creativity in the workplace, many people believe it may only be important to certain industries such as design and advertising, however, this isn’t the case. Creativity in the workplace is a vital component of a successful business. Creative people are problem solvers and they usually think outside of the box and bring new and exciting ideas to the business. As a result, creativity is a necessary skill in everything from architecture to finance to marketing and more. However, it can be difficult to create an environment that supports, encourages and inspires creativity. Whether you’re a SmartWorker or an employer, you can make changes to your work environment that will help inspire creativity and get those new ideas flowing. While you may think, ‘how can changing my décor help inspire creativity?’ what you may not realize is that the designs, colors, and decorations that surround you can help stimulate and boost your creativity. 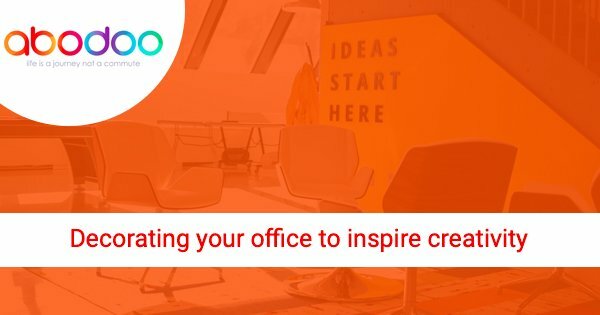 Here are our top 3 tips for inspiring creativity in your working environment. Colour is very important for creating a creative environment. Many offices are usually decorated with less-than-inspiring decor and color schemes. In addition, office lighting is often a white and cold fluorescent light, which is less than appealing. If you have a large office or a small one at home, you don’t have to go over the top with color to add inspiration. You can have a ‘feature’ wall that pops with vibrance and leave the rest a neutral colour, alternatively, you could hang artwork and decorations that will add a pop of color. We all know that feeling of being stuck in a windowless room with fluorescent lights and how confining it can be. One study from Cardiff University’s School of Psychology revealed that the sight of nature could improve a person’s productivity by 15 percent! Therefore, if you don’t have a window to the outdoors or lack natural light, choose light bulbs that aren’t as harsh. White light for example is often very uninspiring and can leave your office feeling rather uninviting. Adding greenery to your office is another great way of inviting the outside inside. ‘Green’ offices with plants have been proven to make staff happier and more productive than ‘lean’ designs stripped of greenery. Regardless if you work in an office or at home, having an area away from your desk is important. If possible, an outside area close to nature will help you relax during your break. Many employers have started to realized that some of the most inspired ideas can come during breaks and that’s why they install games like a football table for their employees. This is because creative ideas often flow better when the mind is more relaxed. This should be no different if you work from home. If possible, find an area in your home that you can transform into a break area. Fill it with plants, bean bags and make it comfortable and you will find that your creative ideas will increase during your breaks. Tell us what you like or don’t like about your office by sharing your office pictures with us on our social channels and we’ll offer advice on where you can make changes to encourage creativity.